Cauliflower is my new thing. I’m trying to lose a few pounds as a New Years resolution, and I’ve recently discovered how awesome cauliflower is for weight-loss so I’m all over it! It’s Low-carb, fat-free, High in fiber and Vitamin C and quick and easy to make. It’s great for replacing carbs in tons of dishes such as rice, potatoes, breads, and even flour! All right, now I’ve told you how much I love cauliflower I’m going to share another cauliflower recipe this week. Remember a few days ago when I shared my quick cauliflower recipe, this is a more flavorful version of the rice. 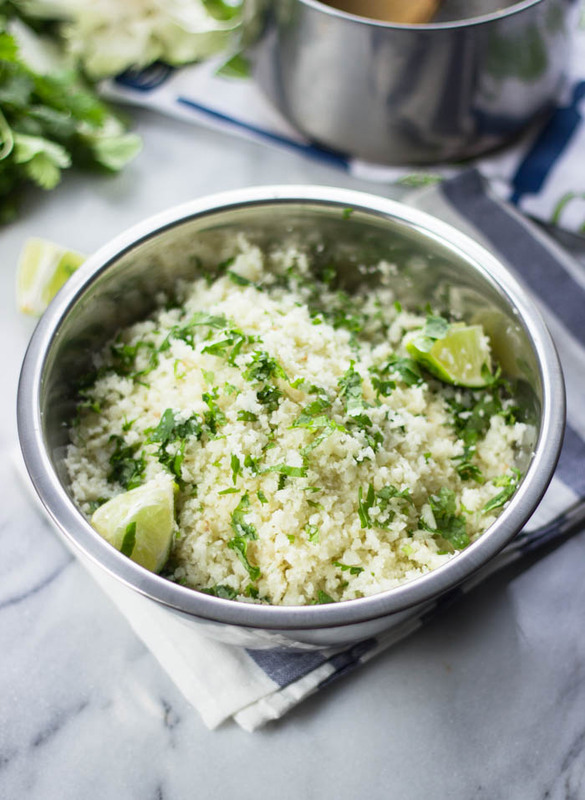 What better way to zest up rice than with cilantro and lime! It’s amazing how much of a difference adding lime and cilantro does to rice. 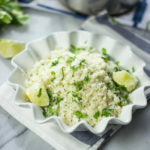 For all the people who stumbled here searching for regular cilantro lime rice, you can totally make this with regular rice as well and just add the cilantro and lime at the end. The cilantro and lime must be added right before serving so if you are going to save some rice in the fridge, add the cilantro and lime right after reheating. 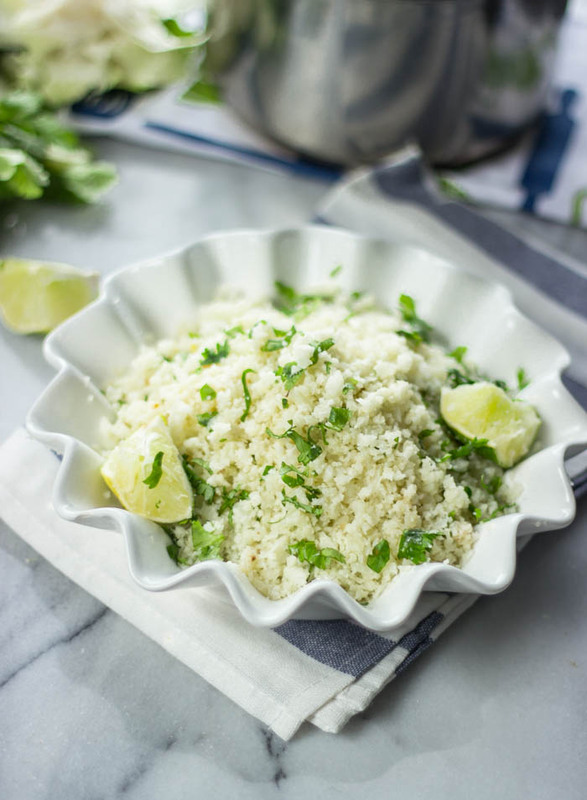 Rice the cauliflower by grating it on the larger holes on a grated or in a food processor. Heat the oil in a large pan or pot over medium-high heat; add garlic and stir for less than 1 minute then add the cauliflower and cook, stirring occasionally, until the cauliflower rice is tender and slightly golden brown, about 6-9 minutes. After the rice is cooking squeeze the juice of 1 lime on to the rice, add the chopped cilantro and gently combine. Serve immediately while the cilantro is still fresh. 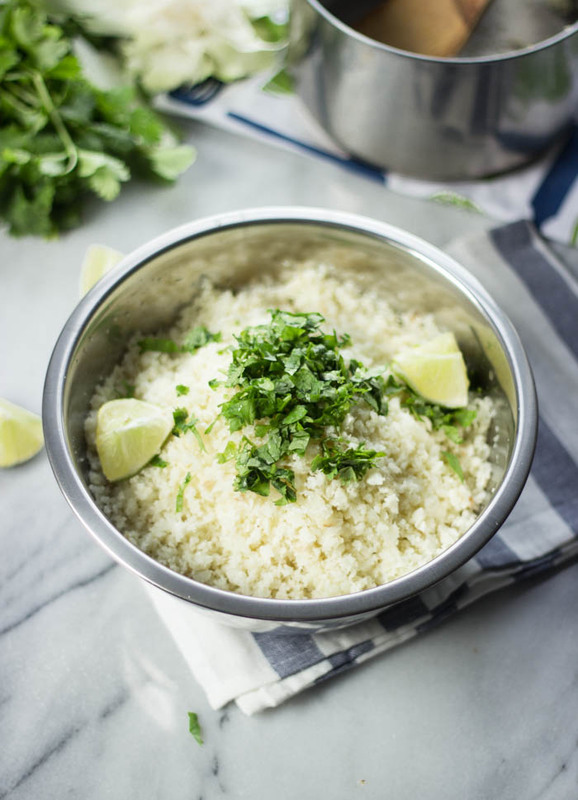 If you are saving rice for later or another day, leave that portion without cilantro and add the cilantro right before serving. This sounds delicious! Do you have to strain the cauliflower at any point?